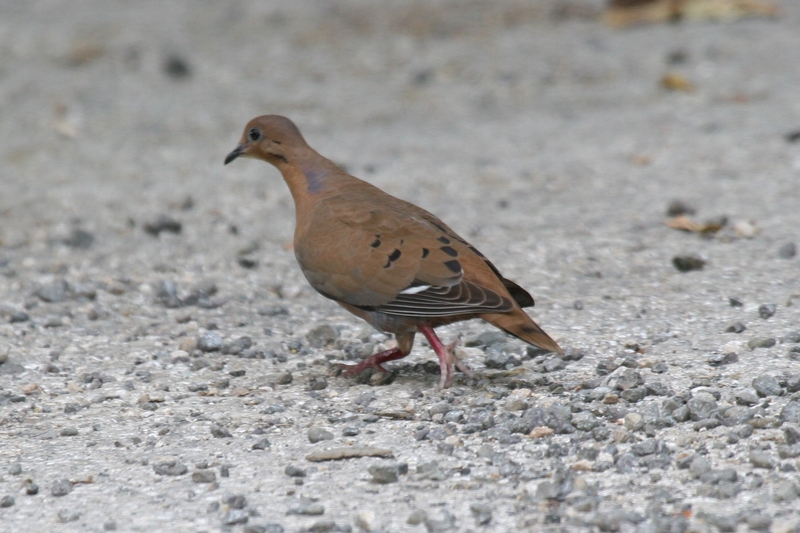 Zenaida Dove (Zenaida aurita) is a member of the Columbiformes family. This family includes many pigeons and doves. Zenaida aurita is in the Animalia kingdom, phylum Chordata, class Aves and order Columbiformes. This species was named by Temminck in 1809. The genus, Zenaida, was named after Princess Zénaïde Laetitia Julie Bonaparte, wife of the French ornithologist Charles Lucien Bonaparte (All about Birds). Zenaida aurita can be found from the Bahamas, Cuba, the Cayman Islands and Jamaica to Hispaniola, Puerto Rico and the U.S. and British Virgin Islands (Hoyo, et al.). It is the national bird of Anguilla (The Website of Everything). It is often confused with the Mourning Dove (Schulz, et al.) Similar species to the Zenaida include the Mourning Dove and the White-winged Dove. It is a common resident of Cuba (Garrido and Kirkconnell). This bird is not globally threatened (Baptista, et al.). The population is significantly increasing (Birdlife International). It is on least concern according to the IUCN red list of endangered species (IUCN). It is, however, hunted as a popular gamebird and, so, is subject to intense hunting pressures (Sol). 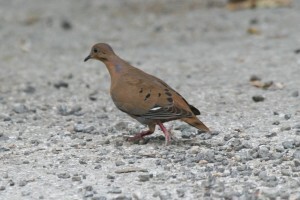 They can breed throughout the Caribbean (The Website of Everything), and there are a variety of names given to this bird such as, Wood Dove; Seaside Dove; Mountain Dove; and Turtle Dove (Bond). 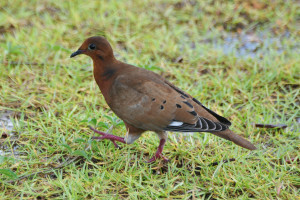 The Zenaida Dove is a medium size dove. It is mostly a cinnamon brown color. The lower neck has luminous purple spots which show more in males. The tail feathers are rounded and have white tips. 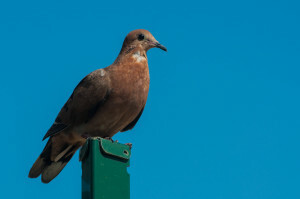 Male doves are usually grayish brown and have more extensive white on the feathers than females (Garrido and Kirkconnell). They have a plump body shape and are 25 to 28 cm (10-11 inches) long. The beak is black, and the legs and feet are red. Males are larger than females. Males weigh from 149 to 180 grams, while female doves weigh from 120 to 145 grams. The wingspans of both males and females are 36 to 41 cm. The Zenaida has a gentle mournful cooing, ‘coo-oo, coo, coo, coo’ or ‘hoo’ooo-oo oo-ooo’, almost identical to the Mourning Dove (Raffale). There are three subspecies Z. aurita (aurita), Z. aurita (salvadorii) and Z. aurita (zenaida). They all differ in color. Zenaida aurita has only twelve tail feathers compared to fourteen in other species of doves (Hoyo, et al.). The Z. aurita (aurita) is darker with a bluish gray color. While the Z. aurita (salvadorii) is more of an olive brown color. This dove can fly fast and has fast reflexes and powerful wingbeats (All about Birds). These birds can live up to 10 years in the wild and 17 years in captivity (Butchart and Erkstrom). Albinism has been seen in the Zenaida doves recently (Beerden and Otis). “Albinism” causes the bird to have lighter or an absence of pigmentation then the original color. The species primary habitat is a tropical deciduous forest. It is also frequently found in open areas including gardens and hotel grounds. It can also reside in shrubbery, woodlands and lower mountain forests (Raffale and Wiley). They usually come out throughout the fall and spring season (Howell, et al.). Zenaida doves often nest in trees and sometimes on the ground on predator-free islands. The nest is a made with twigs and sometimes lined with rootlets or grasses making the structure very flimsy (Hoyo, et al.). Nest sizes can be quite variable (Small). Nests can be found all year but their breeding period is quite variable (Raffale and Wiley). In different locations breeding can occur any time between March and December in the Dominica and May to August in the Virgin Islands, to year-round in Puerto Rico (Hoyo, et al.). The male and female remain together for a few days before starting a nest (Baptista et al.). Males are the ones that find the site to build the nest (Baptista et al.). After mating, Females produce two pure white eggs (Bond). Each pair can brood up to 4 times a year. (Hoyo, et al.). Incubation ranges from twelve to fourteen days and it is carried out by both parents (Bond). 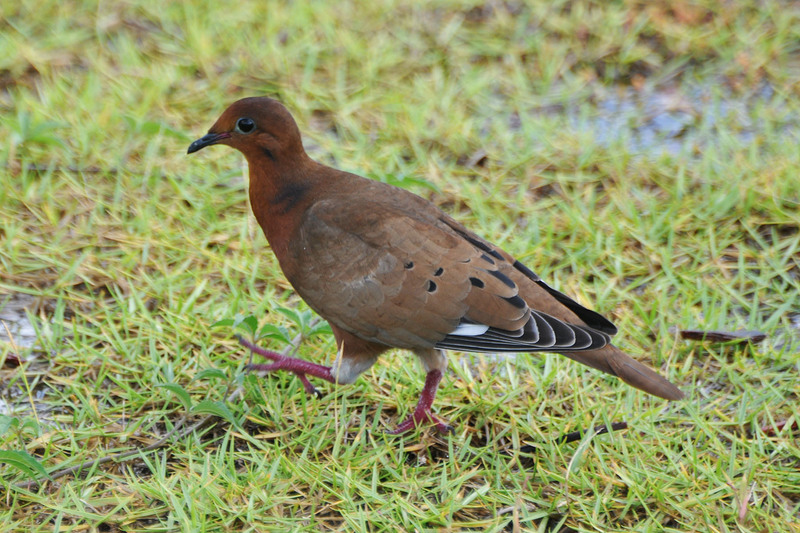 The Zenaida dove typically feeds their young a substance from the adult’s crop. This is known as ‘crop milk’, it is rich in energy and helps the chicks grow quickly. This is later exchange for seeds when the bird gets older. They begin to fly at 13 to 15 days old (Hoyo, et al.) A Zenaida dove can breed for the first time just under a year old (Hoyo, et al.). This bird is usually found alone (Howell, et al,). But if found together it is with a small flock. They often flock together around abundant food sources (Hoyo, et al.). Zenaida doves are fast learners and can quickly adapt to new environments (Serferta, et al.). This species can be seen from sea level and it flies higher than the top of the mangroves (Hoyo, et al.). Zenaida doves are very territorial. They vigorously keep out intruders from their territories (Griffin, et al.). Their aggressive behavior differs between male and female doves (Quinard and Cezilly). Many Zenaida doves have been recently affected by stress throughout their breeding season. Stress can affect the Zenaida dove’s growth rate and flying abilities (Miller). Many Zenaida dove nestlings exhibit “outbreeding depression.” This indicates that they are the product of cross breeding between Zenaida doves and locally ocuring different dove species (Monceau, et al.). 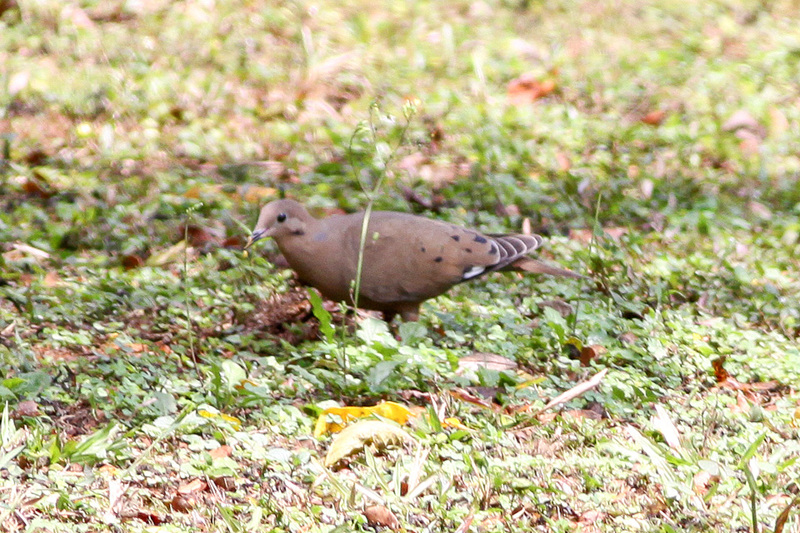 The Zenaida dove searches for food on the ground. It will also fly to streams and puddles in search of water (Butchart and Erkstrom). It rarely perches. It feeds in low bushes and trees along the ground (Howell and Lewington). Zenaida doves eat many different fruit and plants. It also feeds from seeds they found on the ground. It also eats many small insecta such as flies, ants and invertebrates like earthworms (ARKive). The Zenaida Dove eats salt from soil deposits, mineral blocks and other natural resources (ARKive). This can help increase their intake of sodium (Hoyo, et al. ).The salt helps with the egg formation and pigeon-milk production. 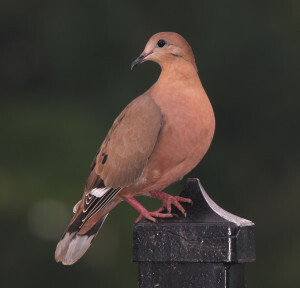 The feeding, courtship and fighting among these doves typically happens during the morning and afternoons, whereas the maintenance activities happen mid-day (Goldberg, et al.). Baptista, L.F, P.W Trail, H.M Horblit, and P. & G.M Kirwan. Zenaida Dove (Zenaida aurita). Zenaida Dove (Zenaida aurita). Handbook of the Birds of the World Alive, 2015. Web. 28 Sept. 2015. Bond, James. Birds of the West Indies. Boston: Houghton-Mifflin, 1971. Print. Butchart, S., and J. Erkstrom. Species. Zenaida Dove (Zenaida aurita). Birdlife International, Web. 28 Sept. 2015. Garrido, Orlando H., and Arturo Kirkconnell. Field Guide to the Birds of Cuba. Ithaca, NY: Comstock Pub., 2000. Print. Howell, Steve N. G., Ian Lewington, and Will Russell. Rare Birds of North America. N.p. : n.p. n.d. Print. The IUCN Red List of Threatened Species. IUCN Red List, 2015. Web. 20 Nov. 2015. Mourning Dove. Identification, All About Birds. Cornell University, 10 Aug. 2010. Web. 28 Sept. 2015. Raffaele, Herbert A., and James W. Wiley. Wildlife of the Caribbean. Princeton: Princeton UP, 2003. Print. Raffaele, Herbert A. Birds of the West Indies. Princeton: Princeton UP, 2003. Print. Zenaida Dove. The Website of Everything. N.p., 2009. Web. 28 Sept. 2015. 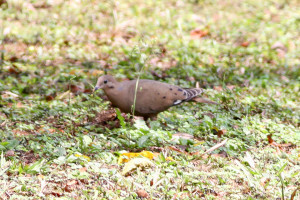 Zenaida Dove (Zenaida aurita), Arkive. Wildscreen Arkive, 2010. Web. 20 Nov. 2015. Beerden, James B., and David L. Otis. “An Observation of a Partially Albinistic Zenaida Macroura.” Southeastern Naturalist 10 (2010):185-188. Academic Search Complete. Web. 28 Sept. 2015. Flexibility In Zenaida Doves (Zenaida aurita).” Behavioral Processes 85.2 (2010): 135-141. Academic Search Complete. Web. 28 Sept. 2015. Griffin, Andrea S, Savani, Rahaul S, and Hausmanis, Kristina. et al. “Mixed-Species Aggregations in Birds: Zenaida Doves, Zenaida Aurita, Respond To The Alarm Calls Of Carib Grackles”. Quiscalus Lugubris. Animal Behavior 70.3 (2005): 507-515. Academic Search Complete. Web. 28 Sept. 2015. Miller, David A. “Immediate and Delayed Effects of Poor Developmental Conditions on Growth And Flight Ability of Juvenile Mourning Doves Zenaida Macroura.” Journal of Avian Biology. Vol. 42: p 151-158 Academic Search Complete. Mar. 2011. Web. 28 Sept. 2015. Monceau, Karine, Frank Cezilly, Jerome Moreau, Sebastien Motreuli, and Remi Wattier. “Heterozygosity-Fitness Correlations in Adult and Juvenile Zenaida Dove, Zenaida aurita.” Journal of Heredity. Jan/Feb2013, Vol. 104 Issue 1, p47-56. Academic Search Complete. N.p., Dec. 2013. Web. 28 Sept. 2015. Seferta, Angela, Guay, Patrick-Jean, Marzinotto, Erika. et al. “Learning Differences Between Feral Pigeons And Zenaida Doves: The Role Of Neophobia And Human Proximity” Ethology 107.4 (2001): 281-293. Academic Search Complete Web. 28 Sept. 2015. Schulz, John H., Gao Xiaoming, Joshua J. Milspaug, and Alex J. Bermudez. “Experimental Lead Pellet Ingestion In Mourning Doves (Zenaida macroura).” American Midland Naturalist, Academic Search Complete. July 2007. Web. 28 Sept. 2015.